This book is a guide to using XML and XSLT for building web sites. However, its focus on XSLT 2.0 and web development is set within the broader context of XML design practices — both artistic and technical. As a result, much of its material is applicable in other domains as well. The book will lead you from developing a comprehensive source definition (including markup vocabulary, schemas, and documentation) for your XML sources, through creating and debugging XSLT stylesheets, to organizing a smooth XML-based document workflow. 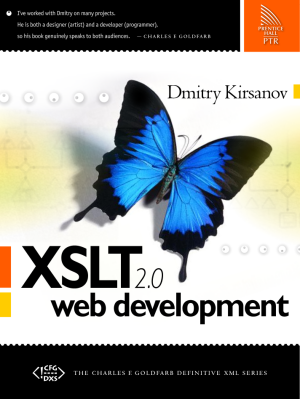 To help you make sense of the XML hype, the book is as practical as possible — its material is based on real design projects of Dmitry Kirsanov studio and features lots of examples with markup and programming code. The primary focus of the book is on openness and usability. Openness means taking advantage of standardized technologies that are widely supported across platforms and enable efficient integration with any XML-based frameworks. Usability means making life simpler not only for the users of your site but for its creators and maintainers as well. July 2004: The book was promoted at JavaRanch Saloon, an influential forum for Java programmers. The winners got free copies of the book. Here’s my favorite thread. Full source code for all examples in the book: ZIP, tar.gz. If you’ve read the book, please leave your comments at the Amazon page. You can also write to the author directly. Please send the author any errors or omissions you notice in the book. They will be published here and fixed in subsequent reprints. Right now, you can pre-order the book at Amazon. It is due out in March, 2004 and will be shipping around that time.